What is the secret to outstanding performance in any field? What makes world class musicians, athletes and scientists different from the rest of us? 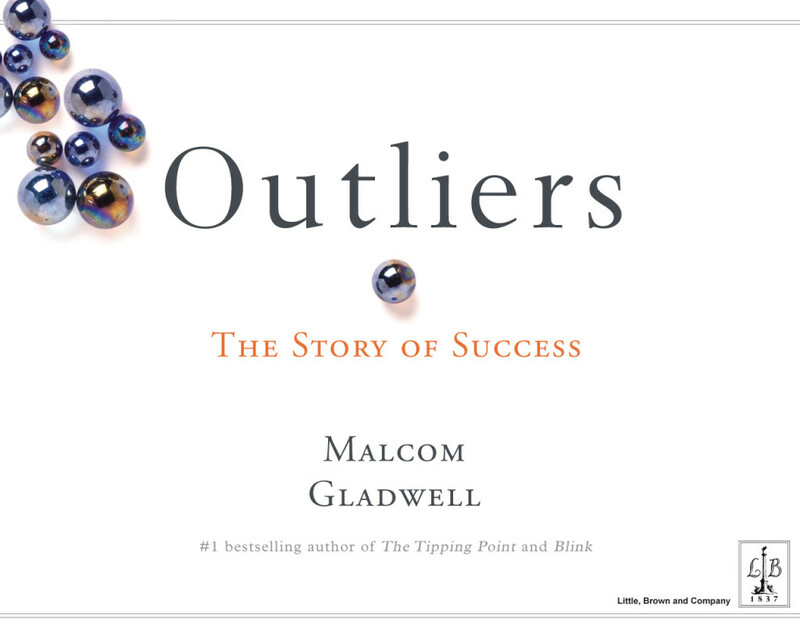 In a similar vein to earlier titles like The Tipping Point and Blink, acclaimed nonfiction writer Malcolm Gladwell spins a fascinating tale on what made people remarkable in Outliers – The Story of Success. Some of the insights raised in the book were not new, especially in the first section on Opportunity. For example, the fact that one has to slog buckets to achieve anything great – an idea that is elegantly captured by Gladwell’s “10,000 Hour Rule”. Almost everybody cited in Gladwell’s book, from Bill Gates to Bill Joy, Steve Jobs, the Beatles, to Joe Flom are obsessively hardworking, putting in numerous hours to sharpen their craft. The other point – that child geniuses not given the right opportunities in life may fail to succeed – is also common knowledge. Two whole chapters were spent elaborating this point, citing how MENSA superstar Chris Langan ended up being a bouncer on Long Island. I’ve seen this happen in my lifetime too, when old primary school mates who topped the class have fallen off the wayside later in life. Others, however, were downright intriguing. One of them was how birth dates played a key role in determining success in sports and early “gifted” programmes. Kids born at the start of the year (say January) tend to be bigger and more mature compared to their peers at the end of the year (November or December). They thus have an advantage over their counterparts from the onset in the current academic system, especially if the selection process (in Singapore, we call it “streaming”) pigeon holes them into different classes. What’s especially disturbing in this case was that the extra hours of training, practice and lessons coupled with the opportunities provided by better teachers/coaches tended to widen the gap. Gladwell felt that such practices of premature selection might do more harm than good as it left out an entire talent pool. The more controversial second part of the book dealt mainly with cultural legacies. Here Gladwell dictated how ethnicity and family histories played major roles in personal accomplishments. Tracing the socio-cultural and economic backgrounds of American immigrants – from Jews to Southerners to Asians – Gladwell argued that plane crashes, family feuds, and success in maths were outcomes of socio-cultural and hierarchical practices in different hunter-gatherer and agricultural societies. As an example, he cited that the high power distance between different ranking staff amongst Colombians and Koreans led to a greater percentages of commercial plane crashes relative to a cockpit staffed by Americans or Australians. The reason for this was due to the lower willingness of first pilots to voice out their concerns when the captain was in the pilot’s seat. Being a person of Chinese ethnicity and a Singaporean, I was rather emused by the chapter on rice paddies and mathematics. The basic premise was that the “meaningful” work (if you can consider it so) of cultivating rice on paddy fields coupled with the efficient and systematic way in which numbers are used in Chinese have helped us East Asians to be superior in mathematics. Of course, the long backbreaking hours (3,000 hours for a rice farmer versus 1,000 hours for a Western wheat farmer) have also fostered an almost indefatigable work ethic in us Asians. Unfortunately, this is where I differ in view. While Singaporean students have constantly topped international Mathematics and Physics Olympiads, it is a far stretch to attribute it to our rice planting culture since we never really had one in the first place. Moreover, mathematics like almost every non-language subject here, is taught in English using Hindu-Arabic numerals (ie 1,2,3,4,5 etc…). Ending the book on a personal note, Gladwell depicted how his mother’s own mixed ancestry have resulted in a positive family legacy, skillfully weaving all the different threads in his thesis into a fairly coherent argument. The moral of his story is that it takes a village to raise a winner, and despite what Frank Sinatra sang, nobody who succeeded in life have truly done it “My Way”. What are your thoughts on the ingredients of success? Does Gladwell’s ideas resonate with you?